March is Developmental Disabilities Awareness and Advocacy Month, a designated time when TuscBDD can create awareness and recognize the many contributions that people with disabilities bring to our community. It’s also a time when people with disabilities can share their stories and show that they are living successful lives. TuscBDD asks everyone in the community to join in celebrating victories, advocating for inclusion, and encouraging awareness! The Ohio Developmental Disabilities Council has chosen "Supports Matter" as the theme for 2019. Additionally, March 21 is World Down Syndrome Day. I asked my friend Chelsea if she would write a guest blog for TuscBDD. I asked her to write about whatever she wanted; whatever she felt like sharing with the world on World Down Syndrome Day. In her blog, I can really see what "Supports Matter" means and how her supports help make her life more fulfilling and her dreams obtainable. My name is Chelsea. I am 24 years old. I live with my mom in Newcomerstown. I am in lots of sports in Special Olympics. I work with Advocates for Success (AFS) in the day. I grew up in Newcomerstown. I went to school and loved it. I was in the marching band, plays, and musicals. I had lots of friends, and they voted for me for prom queen my senior year. When I was just a kid I meet my mom at my school. She was my teacher. Then I was in Middle School and my mom picked me. She picked me for her daughter. Me. Chelsea Lefler. My other family did not want me anymore. They stop taking care of me. I had a meeting about this. I was so sad. But then they tell me that my mom picked me to be her baby girl. I am being okay after this. I went to a career center after high school. I had a hard time after high school because I missed my friends. I cried almost every day. I missed my friends from school. I feel like something was wrong with me. My mom was worried about me a lot. I graduated in May and started to feel better. My mom told me to not stop dreaming. She tell me to believe in myself. I met my SSA Ray after I graduated. He was nice and talked to me about having a job. I want a job. I need to make money so I can live on my own someday. Ray helped me find a job. He helped me be in REM with Kim Chaney. Kim is my coach. Job coach. She taught me about working and doing my best. After I am done with REM I started work at Advocates for Success. Kim and Nancy and my coaches teach me how to work hard at my jobs. I have worked at the mall in Claires, Marshalls, Joann Fabrics, and maybe the Kitchen Collection someday. I have worked on tags. I have worked at my mom's school. I have worked at Browse & Buy. I have worked at Giant Eagle. I have worked on tags and painting the walls. We talk a lot about feelings and no drama at work. I have friends at work. I go to cooking class after work on Mondays. I am still dreaming. I want to work at my job and get a paycheck. I want to buy my own things. I want to live on my own. My mom tells me I can when I am ready. I am also in Special Olympics. My mom is the coordinator. In Special Olympics I am part of bowling, swimming, pep club, skills basketball, volleyball, track, bocce, and skills softball. I have lots of friends at Special Olympics. I have lots of coaches. These are my Rockets family. We laugh a lot and cheer for each other. We try our best and work hard every time. Special Olympics taught me to have a goal and to work on the goal. I love to win gold. I have to work to win this gold. I love to go to state. I have to work hard to go to state. If I cannot win I am be brave in the attempt. I am try my best. My coaches tell me this is all I can do. I have partners in Special Olympics. My uncle Adam bowls with me. Angelica plays bocce with me. Kelly and Shar swim with me. We work together as a team to win. My partners and my team and my Rockets are amazing. I love them. I have friends again. I have a family again. In Special Olympics I am part of the leadership council. I speak a lot. I get to vote. I take notes at the meetings. I help others. I have a voice. My mom and I talked about Down Syndrome. We watched a TV show (Born This Way) and I see other people with Down Syndrome. I asked my mom if I have Down Syndrome. She said yes. My mom asked me if I know what that means, and I said I am awesome. My mom smiled and said yes. Sometimes Down Syndrome makes me feel different than my friends. I am learn from my mom, my coaches, and my friends that different is okay. I am not always different. 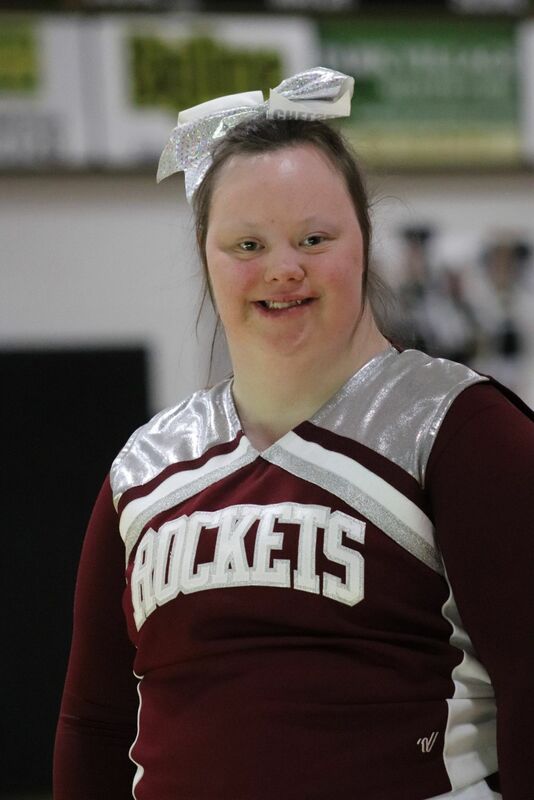 I have Down Syndrome but I want friends, a boyfriend, a job, live on my own, hang out, play sports, and learn. I need some help but my mom says to keep dreaming and working. This is me. Chelsea Lefler. I love my life and I love you guys. Thank you for reading.